Set in the 80’s, where the player is in control of Tommy Vercetti, a prominent figure in the Liberty City mafia who is sent to the Miami inspired Vice City to establish a foothold on behalf of his bosses back home. Unfortunately, Tommy quickly realises that beneath the glitz and glamour of the neon lights and exotic clubs is a very dark and violent world indeed. Variously teaming up with, and fighting against some of the most depraved and violent criminals that the city has to offer, the player will control Tommy in his bid for total control of the city. 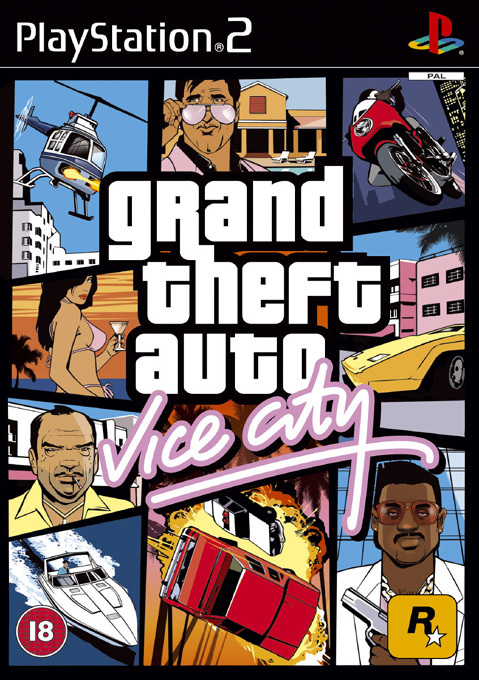 Designed entirely as a free roaming, open ended sandbox style game, criticisms and concerns that Grand Theft Auto: Vice City was nothing more than GTA 3 with hairspray and shoulder pads were quickly dismissed. For one, Grand Theft Auto: Vice City actually provides its protagonist an opportunity to speak and therefore express his personality (as wonderfully portrayed by Ray Liotta). 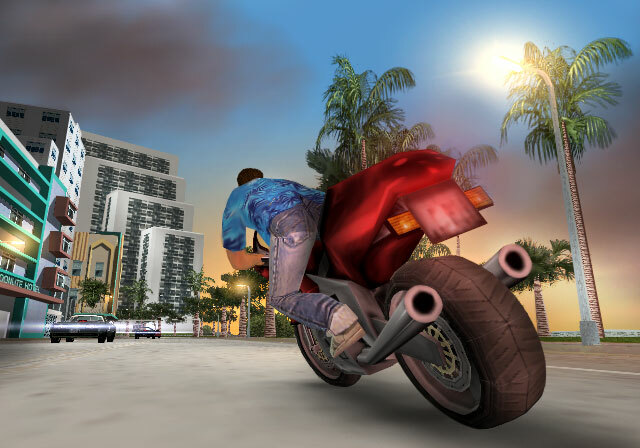 In addition, Grand Theft Auto: Vice City offers a substantially meatier gaming experience for the player. With its predecessor, GTA 3, the player was limited to completing missions, and a handful of additional content such as kill frenzies and side missions like vigilante. With Grand Theft Auto: Vice City however, the player will actually have the opportunity to purchase property thereby allowing them to get more from the game. Specifically, the player will be able to invest their ill-gotten loot in a variety of different businesses which will in turn generate the player additional revenue and income during the course of the game. The player is not restricted to purchasing businesses as part of their expanding criminal empire, they can also purchase safe houses which will allow the player the opportunity to save their game more easily, not to mention provide them with a convenient location where they can acquire additional firepower if required. Grand Theft Auto: Vice City takes place in the 80’s and everything about the game, from the design of the cars, to the music that is included within it, even the clothes that people wear are all highly accurate depictions of the era itself. Unlike GTA 3, the player will also enjoy the opportunity to wear different outfits, and these additional outfits can either be earned by successfully completing various missions, or purchasing them. This is not intended solely to provide the player with a cosmetic change, but rather, an opportunity to also lose the unwanted attention of the police. The music of Grand Theft Auto: Vice City can be summed up in a single word: sublime. Featuring a wide, wonderful and highly eclectic mix of different genres, all of which are from the 80’s, means that there is sure to be something for everyone. There are multiple radio stations with each one dedicated to a particular style of music. For example, the radio station Wave 103 is devoted to New Wave Music and so expect to hear the likes of Spandau Ballet’s Gold, I Ran So Far Away by a Flock of Seagulls. Flash FM on the other hand, will appeal to those of us who prefer pop music. Wang Chung’s Dance Hall Days and Go West Call Me are just a couple of the great songs that this particular radio station has. 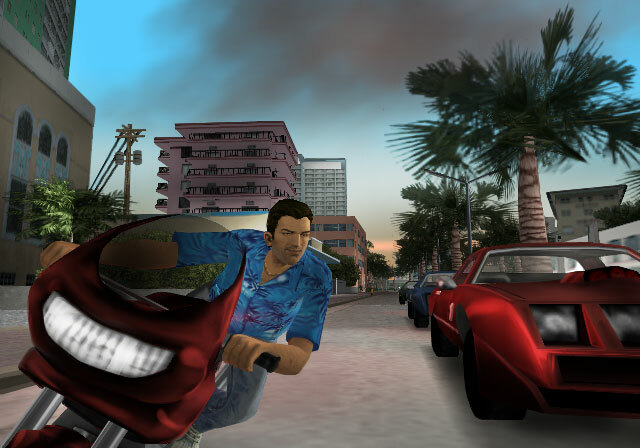 With Grand Theft Auto: Vice City, the setting may have taken a step back in time but this does not mean to say that the game itself is dated or out of style, and indeed, the game designers are to be commended for the innovative and dynamic new approach they have imposed on the game. © Copyright 2019 - 2000, All Rights Reserved PS2 Home.